This is probably one of my favorite posts! I live in sunny SoCal, so the rain doesn't like to visit often, but when it does...all of those things you said...I like to do. Tea, books, movies, cuddle...sit in my window seat or in my car & just watch the rain hit the flower petals...it's so relaxing & magical! Great post Katie! I spend my raining days in bed reading, like you mentioned. Then the next day when it's sunny again, I feel super refreshed. I always make sure I'm in the car for rainy days too. I have two toddlers (4 and nearly 6) who worship the rain. Literally. They do that by taking off all of their clothes and run around like two puppies, laughing. do, on rainy days, is run after the above mentioned worshipers with rain coats and wellingtons and do a lot of begging, oooh-ing, ahh-ing, (these are words. I swear.) getting soaking wet and anxious. Before I became the anxious, soaked mom that I am, I used to spend rainy days working- sewing, knitting. I used to think rain is inspiring. I usually spend my rainy days playing Animal Crossing on my DS or just lie in bed all day sketching. 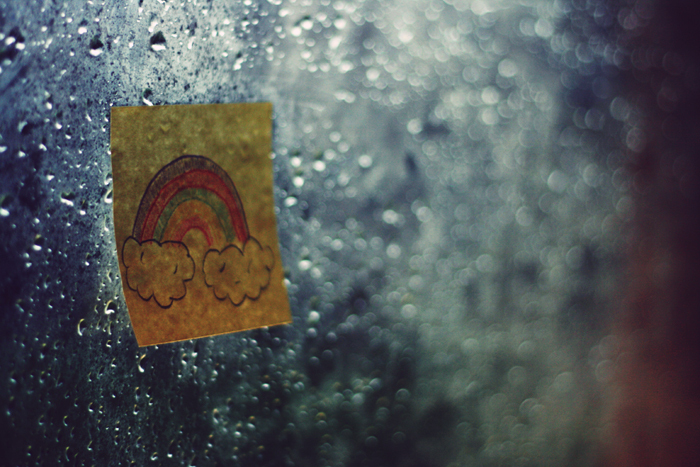 Rainy days usually make me happy. Everything you said! I've *always* loved the rain. When I was a wee one, I changed the words to the "Rain, Rain, Go Away" song. I wish I could remember, but it was something like "rain, rain, please stay, and come back everyday!" rainy days are the BEST sleeping days. i like to spend mine cuddled up on the sofa with tons of blankets reading or watching movies!! I LOVE the pictures, although the second lady looks like she's had it. lol What do I do? If I"m lucky, I don't have to drive anywhere and I get to lock up in my studio and create pretty things, then cook a delicious meal and enjoy my glass of wine while watching the rain. Yep - pretty perfect. I am NOT a fan of the rain. It's been (unseasonably) raining like crazy in Arizona. We all make jokes about how if we wanted this, we'd all move to Seattle. Sad, but true! I love rainy days when I can sleep in! i LOVE the rain :) it started here as i left work so i walked home very slow to experience every last drop, i just think it's so refreshing?! and the smell of all the trees + plants afterwards is dreamy! ok i better stop there before i come across as a weirdo -rain freak! My rainy days usually consist of waiting outside for a bus that never comes, jumping over flooded gutters. Eating lunch at my desk because I don't want to go back out there, waiting for a crowded bus with wet people to take me home, trying not to slip because there is standing room only. Thank you for the piggies photo! SO CUTE! i love a rainy day. i love looking out the window when its pouring! and i love an excuse to wear my rainboots! hope your having a great productive week! That´s why when it rains I prefer to stay at home sewing, reading... and wishing for the sun!!! Ah! Those piglets make me super-happy! he he. :) It rains a lot here in Vancouver, and there's nothing better than cuddling up on the couch with a new movie, hubby, and a big ol bowl of popcorn, I think. :) Not (*every time* it rains though...) lol. It's been pouring all morning! I LOVE the rain! Love your blog and this post! I live in Portland and sometimes it seems like the rain never stops here! But I do still love watching the rain. Especially when it's extra stormy!